are buried here. Their Arabic names: Salam, Salum, Sahuli, and Alqia. A while ago, I was interested in doing some research on the water supplying methods used in Persian antiquity. Evidently, in many regions of the Iranian plateau, providing clean water to urban settlements has long posed a formidable challenge. Unfortunately nowadays, Qazvin has merely taken the role of the city for popular obscene jokes. After all, it is where the likes of Obeyd Zakani came from. But then again it is also where Ali Akbar Dehkhoda -- arguably the father of modern Persian and the compiler of the most comprehensive Iranian dictionary, the Loghatnameh -- came from. With over 2000 architectural and archeological sites, I'm here to tell you that Qazvin is one of Iran's most culturally unappreciated cities. To begin with, archeological findings in the Qazvin plain reveal the existence of urban agricultural settlements as far back as 7000BCE. The name "Qazvin" or "Kasbin" is derived from Cas, an ancient tribe that lived south of the Caspian Sea millennia ago. The Caspian Sea itself in fact derives its name from the same origin. Not many people know that the current city was founded by Shapur II in 250CE, and was made capital of Persia in 1548 by the Safavids, before moving it to Isfahan 50 years later. Qazvin was occupied by the Russians in both World Wars, and is where the famous coup d'etat was launched from that led to the rise of the first Pahlavi dynasty in 1921. With the gradual growth of the city, wells and qanats could no longer respond to the needs of the locals. That is when some wealthy residents started building private reservoirs called ab anbars. These sub-level spaces were connected to the city's qanat network and were filled by someone called a meerab. It was he who was responsible for distributing the qanat network. If a house wanted its ab anbar filled, they would ask the meerab to open up the qanat to their ab anbar. An overnight appointment would be enough to fill a typical residential ab anbar. A typical residential ab anbar would be located in the enclosed garden of a residence, have the capacity to hold around 50 cubic meters, would be filled once every two weeks, and have its inside surfaces cleaned from sediments once every year (a process called layeh-rubi). Soon public ab anbars were constructed throughout Qazvin. By the early 20th century, the number of public ab anbars in Qazvin was recorded to be at 151. The water quality was often satisfactory and cold. Ab anbars tend to keep the water temperature at chilly levels due to the underground heat resistance properties of the construction material used. This author was able to verify the near freezing temperatures of the water inside a functioning ab anbar in the desert city of Naeen, while outside temperatures were well over 100 degrees. It is one of those fascinating advanced physics applications of the past that we run into every once in a while. Most public ab anbars ended up being located in proximity or adjacent to commercial and religious centers, or busy intersections. Unfortunately the urban fabric of Qazvin has changed dramatically over the years. Hence the remaining ab anbars today seem to be situated out of place. Of the 100 or so ab anbars that used to be scattered throughout the city, today no more than 10 ab anbars remain intact from the destructive forces of hasty modern urban development. Most have been destroyed by housing projects and private developers. None of those remaining are in operation. One cannot help wonder why would local authorities sanction the destruction of these cultural remnants. One answer perhaps lies in the fact that unfortunately even up until this very day, not enough public value is attached to architectural and historical relics in Iran. Structures like ab anbars have simply never been registered as having much cultural significance, and little if any effort was made for their preservation. Unlike Venice, where the city council monitors and regulates any change to every building, explosive migratory trends in the last 50 years have stemmed a wave of hasty urbanization that has destroyed much of Qazvin's original fabric. Thus when comparing Qazvin to Yazd, for example, Qazvin has less surviving ab anbars despite the fact that Yazd's ab anbars have been retired for much longer time periods. For their construction, a special mortar called sarooj was employed that comprised of: sand, clay, egg whites, lime, goat hair, and ash in specific proportions. This secret mixture was thought to be completely water impenetrable. The walls of the storage were often 2 meters or more thick made with customized bricks. Some ab anbars were built underneath caravanserais. 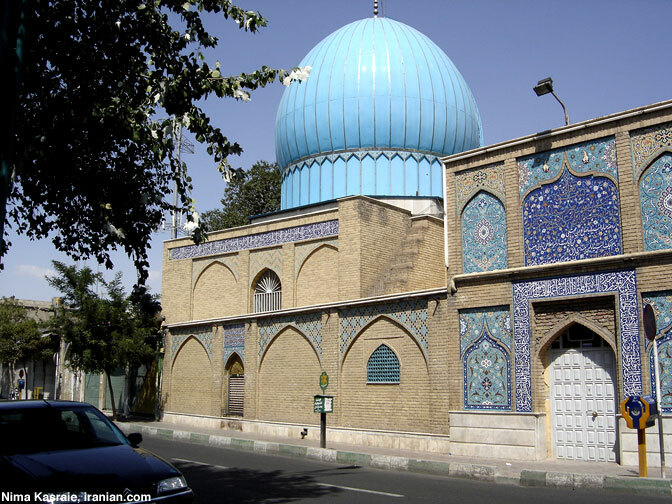 Sometimes they would be built under or adjacent to mosques, such as the ab anbar of Jame, which is located adjacent to the 1200-year old Qazvin Jame Mosque. The bottom of these storage tanks and bath-houses were often filled with heavy metals for fortification purposes. Agha Mohammad Khan Qajar, is said to have extracted the metals from the bottom of the Ganjali Khan public bath-house to make bullets for an upcoming battle. According to one interviewee, the builders would first construct the storage space of the reservoir, then fill it with hay and straw up to where they could start constructing the dome by standing on top of it. After finishing the dome, the straw would then be set ablaze, clearing the space inside. Iran's largest single domed ab anbar, was made in Qazvin by two brothers by the names of Mohammad Hasan Khan and Mohammad Hosein Khan e Sardar who were commanders of the Fath-ali Shah's (1762–1834) army. During the war against Russia, the two brothers made a vow to build a mosque, school, and two ab anbars in the driest part of the city if they returned victorious from an upcoming battle. Both ab anbars were finished by 1814. Both brothers died in battle a year later. Nobody had direct access to the body of water itself, hence minimizing possible contamination. To even further minimize contamination, the storage tank's interior was scattered with a special salty mixture after filling that would form a surface on top of the water that would prevent airborne particles from mixing into the water underneath. The water surface would then be routinely monitored to ensure that it had not been disturbed. All of Qazvin's ab anbar entrances have recently been gated for protection purposes, since these ab anbars are empty and closed to the public. The Mowla Verdi-khan ab anbar, located in the central old quarters of the city, was gated only last year after repairs and preservation began. Cleaning up the hundreds of discarded narcotics syringes and heaps of garbage took several months. According to an inscription on top of its entrance, the Mowla Verdi-khan ab anbar was built in 1763 during the Zand dynasty. The reservoir sits below a mosque and famous seminary. The board of trustees of the mosque plan to convert the former ab anbar to a study area for college prep teenagers. Another ab anbar "somewhat" in use today in Qazvin is one that has been transformed into the workshop of a musician who builds setars. Built by a local physician in 1828, the Hakim ab anbar provides a cool and quiet place for luthiers, an excellent method of preserving such relics. My observations have been that the hotter and drier the air, the more efficient an ab anbar/qanat system seems to work. Perhaps the reason for this is the optimal efficiency of windcatchers in places like Yazd, Kashan, and Naeen. Windcatchers (baad geer) are marvels of technology that can be incorporated into modern architecture designs for arid regions (See here). They use no electricity, and create unbelievable ventilation and cooling in desert architectural designs. The conclusion I wish to make of all the aforementioned is that in the case of Iran, modern advancement does not necessarily always have to come from the west. Many ancient elements, concepts, and methods used in antiquity can be elegantly re-incorporated back into modern designs. An excellent example is in novel architecture designs that can easily create spatially and environmentally efficient structures which are both aesthetic and pleasing to the eye, and yet technologically energy conscious and "green" at the same time. Traditional Persian architecture alone has a myriad of elaborate elements to extract from. The vast diversity of the arts, traditional crafts, and cultures, by itself can be used as a source of revenue, if nothing else, even capable of replacing petroleum as a main source of income. With 12% of Iran's cultural relics located in Qazvin, the possibility exists to turn the city from one of a source of obnoxious lame jokes to a source of great pride and prosperity.